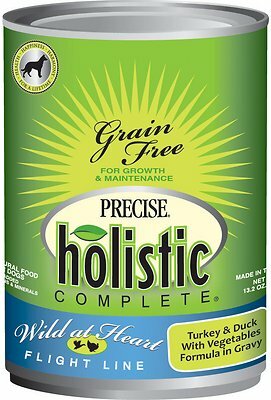 Nourish your furry best friend with the complete and balanced nutrition of Precise Holistic Complete Turkey & Duck "Wild at Heart Flight Line" Grain-Free Canned Dog Food. 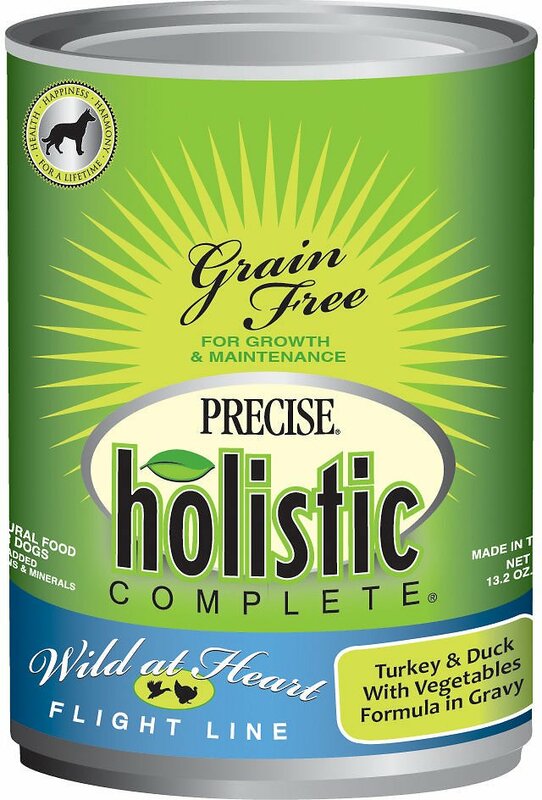 Featuring real duck and turkey in the first ingredients for a high-quality protein formula that’s great for all life stages—from puppies to adults—plus turkey broth for added protein and moisture. It also includes herbal ingredients, nutritious fruits and vegetables, probiotics and more good stuff dogs need to thrive throughout their lifetime. With added vitamins and chelated minerals, so your pet can better absorb them. This grain-free canned food is filled with natural antioxidants from fruits and vegetables for his over health and well-being. Best of all—it doesn’t contain corn, wheat or soy, so it's a perfect option for pet parents who are concerned about allergies, obesity, and digestibility. Made with quality proteins from real turkey, duck and vegetables for a taste your pup will love, plus turkey broth for added protein and moisture. Grain-free, so there's no corn, wheat or soy, making it the perfect option for pet parents concerned about allergies, obesity and digestibility. Chelated minerals are included to be more easily absorbed by the body and provide the correct balance of daily mineral requirements. Added rosemary and turmeric for natural antioxidants that help fight free radicals in the body, plus chamomile, dandelion and peppermint for added natural digestive aids. It also contains cranberries and blueberries for a natural source of antioxidants to promote health and vitality, plus it’s made in the USA. Turkey Broth, Turkey, Turkey Liver, Dried Egg Product, Duck, Potato Starch, Peas, Guar Gum, Carrots, Sodium Phosphate, Calcium Carbonate, Natural Flavors, Potassium Chloride, Salt, Minerals (Iron Amino Acid Chelate, Zinc Amino Acid Chelate, Cobalt Amino Acid Chelate, Copper Amino Acid Chelate, Manganese Amino Acid Chelate, Sodium Selenite, Potassium Iodide), Vitamins (Vitamin E, A, B12, D3 Supplements, Thiamine Mononitrate, Biotin, Riboflavin Supplement), Choline Chloride, Dried Cranberry, Peppermint, Chamomile, Rosemary, Dandelion Extract, Dried Tomato, Dried Blueberry, Turmeric. Feed according to the age, size and activity of your dog. Feed at room temperature and refrigerate unused Portion. Like most can foods , precise does not smell obnoxious as others do . My dogs & foster dogs love this food ! Canned dog food I purchased in the past when my dog had the runs, I believe helped him recover. This and another of the same brand I ordered did not help at all. I have ordered another brand to compare. My pup really enjoys this canned food. We mix about a tablespoon in with his dry food three times a day. I like the gravy content as it helps soften his dry kibble. Both of my dogs love this canned food. It is the first product we have tried from this brand, but they have really enjoyed it. That being said, they are not picky at all and pretty much enjoy all food! I do like that this canned food has chunks, we usually feed them pates so this is a nice change in texture. One of my dogs has several food allergies and she is able to eat this food with no problems (we had her tested so we know exactly what ingredients to avoid). I've been searching for a wet food to use as a mix-in with dry food for my dog. After trying several different brands, this is the one! Nice chunks of meat and a thick gravy and actually smells great. My dog absolutely loves it! This product is great! My dogs love it! I love the fact that it doesn't contain all the fillers that other products do and seems to help with my dogs allergies because it uses and alternative meat source. I would recommend this to other dog owners. High quality food and great price. I would recommend this food.